Narksamphan Co., Ltd has involved into one of Phuket’s leading Construction Companies. Its impression record of successfully completed construction projects over 10 years, uniting quality and competency reflects both the company’s reputation and the achievement of customer satisfaction. Narksamphan Co., Ltd has built our fame by performing the highest quality construction work and providing the most efficient solutions on a wide range of high profile projects. We understand our clients business, protect their interests, and bring integrity as well as reliability to every project. We also have the capabilities and local expertise to address each region’s unique geological construction needs. Additionally, we have professional engineer and architect teams to manage and examine all projects committed to meeting the highest standard. 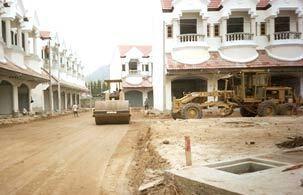 Narksamphan Co., Ltd offers a variety of construction services to both public and private sectors in Phuket. The company provides services as a main contractor, sub-contractor and designer. Our mission is to provide construction services which will exceed customer’s expectations and continue leading the industry with an uncompromising standard of quality. Be reliable and allow us to reward your project with the highest quality and standard.